For example, in the “motion-maze task” (Pederson & Schmitt 1993) participants see a toy move on a table. They are then rotated 180° and asked to recognize, on a table with a maze-like diagram, the “the path traversed from within a maze-like diagram containing both absolute and relative possibilities“ (Levinson et al. 2002). Interestingly, speakers of relative languages such as Dutch or Japanese recognize the path based on the relative frame of reference they employ in their language whereas speakers of absolute languages such as the Australian Aboriginal language Arrernte or Tzeltal recognize the path based on their absolute frame of reference (Levinson et al. 2002, Levinson 2003). Results like this were achieved on a wide array of space-based tasks, so the overall findings that relative speakers prefer relative FoR in spatial tasks and that absolute speakers prefer absolute FoRs seems to be quite robust (Haun et al. 2006). Differences in Spatial Cognition in Childhood? In a recent set of experiments Haun et al. (2006) tested how soon a cognitive bias in spatial cognition manifests itself. They tested 7-11 age year old children from a Dutch village, who mainly use an egocentric FoR) and from a Khoisan hunter–gatherer community in Namibia called =/= Akhoe Hai||om (to be honest, I don’t have any idea how to pronounce this), who almost always use absolute spatial descriptions. They were then shown the location of an object that was hidden under one of the cups. Then, and this is the crucial bit, they were asked to indicate the spot where they thought the object was hidden this time. In the experiment, there were three conditions. First, an egocentric one: if the object was hidden to the left of the subject, it was also hidden to the subject’s left after she was rotated to her new position. 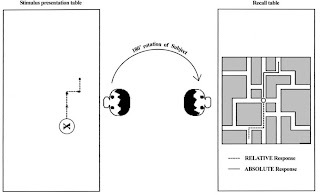 “hiding and finding cups maintained position in relation to a salient landmark between the two tables, namely the screen or the experimenter” (Haun et al. 2006 : 17659). And finally, there was a geocentric condition where, if the hiding cup was to the north-west, it would also be the to the north-west in the rotated position. After repeated trials on all the conditions the following picture emerged: Hai||om children and adults were faster to learn and made the fewest errors in the absolute condition and Dutch children and adults were best in the egocentric condition. “This correlation is fully robust by age 8 and persists into adulthood. In sum, Dutch and Hai||om subjects varied in their preferred cognitive strategy to solve a spatial relational learning task, and their preference matched the preferred mode of description in their respective language” (Haun et al. 2006 : 17570). is there a primary and basic, “innate” frame of reference ? is there a cognitive default setting that we and the other great apes inherited from our last common ancestor which is only later overridden by cultural factors? I’ll return to these questions in my next post. Haun, Daniel B. M., Christian J. Rapold, Josep Call, Gabriele Janzen, and Stephen C. Levinson. 2006. “Cognitive Cladistics and Cultural Override in Hominid Spatial Cognition.” In: PNAS 103: 17568–17573. Pederson, Eric & B. Schmitt 1993. Eric’s maze task. In Cognition and Space Kit Version 1.0 (pp. 73–76).Nijmegen: Cognitive Anthropology Research Group at the Max Planck Institute for Psycholinguistics. The body has no way of having an innate frame of reference without the interference of thought. Thought is the space and the separation between these otherwise discrete events. Thought is shaped by culture and experience. Without thought, there is no interpretation or continuity of these independent events.